Drying is the oldest method of preserving food. Ancient peoples didn’t have refrigerators, freezers, tin cans, or jars. They simply used the sun to dry berries and meat for jerky. Today, drying still has advantages. If you come back from a farmer’s market with a bushel of apples or you have a tree in your backyard loaded with fruit, you can shrink down most of that inventory into a few containers. As the food dries, its natural sugars become concentrated and the flavors intensify. You don’t have to add any sugar or fat. You can dehydrate all kinds of produce such as bananas, cherries, tomatoes, apples, plums, and apricots. In order to safely dehydrate food, you need dry, controlled heat to force moisture from the food, and air circulation to carry the moisture away. When food is dehydrated, 80 to 95 percent of the moisture is removed, so bacteria and other spoilage microorganisms can’t grow. But drying doesn’t kill the microorganisms already present. The food can still spoil if not enough moisture is removed. An electric dehydrator provides the most reliable and consistent results for drying foods because of the controlled temperature and airflow. You can also dry food outdoors, but you need bright, hot sunshine; low humidity; and low air pollution. The Ball Blue Book Guide to Preserving advises daytime temperatures of at least 90 degrees. The hotter the weather, the faster, and more safely, your foods will dry. Also, you need a screen or netting to protect the food from insects. If you have a dehydrator, follow your manufacturer’s instructions for best results. It’s a simple, straightforward process: Wash, peel, and pit the produce; cut or slice in uniform pieces. Dip fruits such as apples, bananas, and peaches in pineapple or lemon juice to keep them from oxidizing and turning brown. Then place them on the dehydrator screen. Cover with the lid and turn the dehydrator on. Dry until crisp and moisture is removed. The dehydrator that I used has 10 trays. 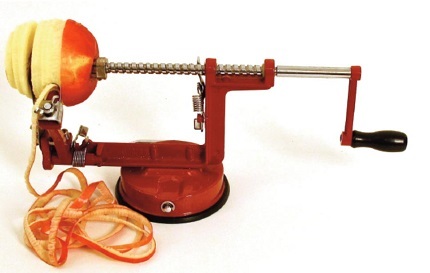 The first step is to wash the apples and set up the apple peeler. Spread waxed paper or plastic wrap on the counter and pour the pineapple juice into a bowl. Set up your work station so you can peel the apples, dip them in pineapple juice, and place them right on the dehydrator trays. Place the stem end of an apple into the three prongs of the peeler arm. Turn until the apple is peeled, sliced, and cored. Set the apple on the tray, and with the paring knife cut a slit in the apple all the way to the bottom. Apple peelers look scary, but they are easy to use. Now place the apple slices into the pineapple juice, making sure all slices are covered, as this will keep them from darkening. Put the individual slices onto the dehydrator tray. As you fill a tray, place it on the dehydrator. Once all the trays are filled and in place, turn the dehydrator on. My dehydrator takes 6 or 7 hours to dry apples. Of course, I live in an area without much humidity! At 3 hours, I open the dehydrator and turn the apples over tray by tray. This keeps them from sticking to the trays once dried. This a great for a quick snack, or for a great treat on breakfast cereal. For more lean and lite ideas like this one, check out Tipping the Scales in Your Favor – trade paperback. Permanent weight-loss is not a diet; it is a lifestyle change. There is no one "magic bullet." Instead, it's a matter of consistently incorporating a number of steps that include exercise, eating right and accountability. It's like leading a symphony: You've got to have all the instruments playing at the same time or you don't get the results. In Dian's book, Tipping the Scales in Your Favor, she shares step-by-step what she did to lose more than 100 lbs. and keep up an active lifestyle. The pages of the book come alive with practical tips, healthy recipes, more than 175 beautiful color illustrations and her refreshing and honest story of the journey. Go to http://www.dianthomas.com to see how to order.